I TAKE a lot of photos. Heaps. It’s become an obsession of mine, which is a bit amusing given that I’ve made a career out of words or out of being in front of a camera. I recently snapped a shot of Sydney’s iconic Anzac Bridge, with its supersized Aussie and Kiwi statues posted like armed sentinels at the western end, in the dawn’s ethereal light. It was part of a photo essay I’m cobbling together for April 25 this special year. The commemoration of Gallipoli — and those first, wide-eyed Anzacs who jumped ashore — is about to wash over our collective emotions, on both sides of the ditch. In 1915 our brothers died on that godforsaken Turkish peninsula at the appalling rate of 45 Anzacs a day. But. When I focused on the high Anzac Bridge flagpole all I could see was a fluttering Union Jack. The Southern Cross — with it’s familiar Federation Star — was somehow lost in the flag’s folds. I smiled to myself, thinking how appropriate it was — given that most of the 10,920 Anzac boys who died at Gallipoli had fought under the Union Jack. Or, occasionally the red Australian ensign. The mythology — and rampant misinformation — about Australians "dying under the flag” boggles the mind. It’s just not true. For neither of the two World Wars. The now familiar blue ensign, which didn’t officially become our flag until April 14, 1954, was rarely even sighted at Gallipoli — or any of the other bloody killing fields that followed on the Western Front. 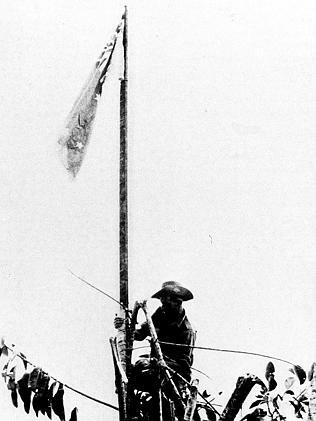 In the War Memorial’s prized photograph taken on December 23, 1943, Sgt T.C Derrick — a South Australian who went on to win the VC — is shown hoisting the red ensign in Sattleberg PNG, after the village had been taken from the Japanese. But it isn’t just ‘ at war’ that the facts are distorted. 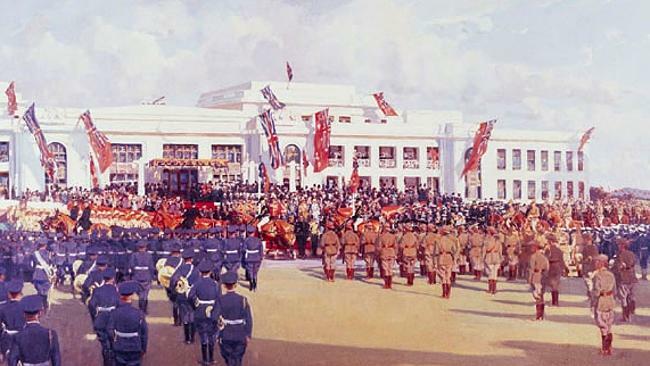 The famous Septimus Powers’ painting of the 1927 grand opening in Canberra of the old Parliament House shows a sparkling white building festooned with Union Jacks on the top and red Australian flags obligingly waving below. There’s not an Aussie blue flag to be seen. What’s more, rather than having some sacred, pristine origin, the truth is that the flag we fly so proudly on this Australia Day was the winning entry in a cigarette promotion campaign in Melbourne in 1901. A bloody cigarette ad. And what about every state flag — every one a relic from our colonial past, every one sporting the Union Jack in pride of place, in the top left hand corner? How many of our soldiers died fighting under those state flags? None. So why are those state flags all still so untouchable, too? And what does it say about us and our need to cling to the apron strings of England 114 years after Federation? Meanwhile, New Zealand (whom we condescendingly pat on the head as a bit rustic and slow in all but rugby) has decided to seize ‘the one hundred year anniversary’ of Gallipoli to launch a fair-dinkum flag debate. Unlike us, our Anzac mates have decided it’s time to grow up and become truly independent. 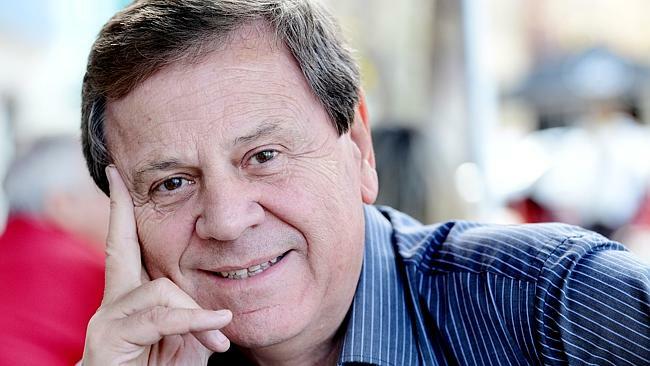 Quite frankly, the Kiwis are tired of being mistaken for Australia in the sporting world, with a flag "dominated by the Union Jack in a way that we ourselves are no longer dominated by the United Kingdom”. How refreshingly laudable is that? So, later this year they’re going to "formally, carefully and respectfully” consider a range of new designs and then choose one which will be put up against the current flag and voted on by every Kiwi in a referendum. No doubts about the result. Meanwhile, as we see at every press conference and as we saw at all the G20 meetings in Brisbane, Tony Abbott’s staff now scrupulously fold the flag behind the PM so all we see is the Federation Star — not the Union Jack. How absurd is that? 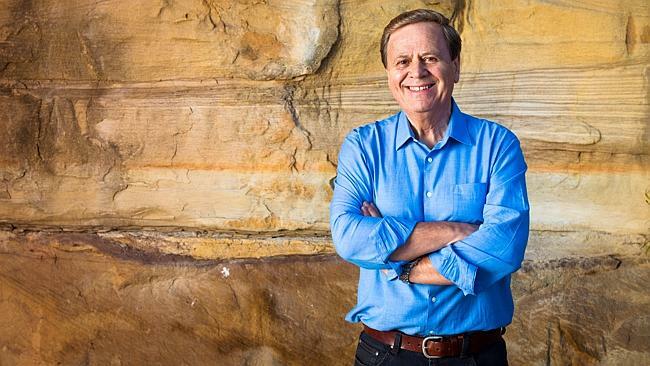 So, by the end of 2015 Australia will be of the last countries in the old British Empire — in the world — to still slavishly curtsy to its colonial past. "Great Britain by night!! !” as Jerry Seinfeld once deliciously described the Aussie flag. What a sad yet amusing description. That aside, have a wonderful Australia Day.